In a large bowl, beat the butter and sugar with an electric hand whisk until pale and fluffy. Add the eggs, 1 at a time, beating well after each addition. Using a large metal spoon, gently fold in the flour until just combined. The mixture should drop off the end of the spoon when tapped – just add a little milk if it’s too thick. Spoon the mixture into the prepared cake tin, level the top with the back of the spoon and bake for 40 minutes, or until springy to the touch. Allow the cake to stand for 5 minutes, then remove from the tin and cool on a wire rack. Peel off and discard the baking parchment, then cut the cake in half horizontally. Whip the cream until it forms soft peaks, then sift in the sugar. Fold in the yogurt and spread the mixture on the bottom cake; scatter over two-thirds of the strawberry slices. Press on the top layer of the cake, then dust with icing sugar and top with the remaining strawberry slices. 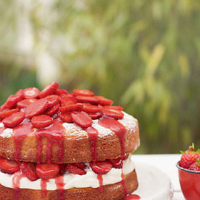 Pour the strawberry sauce over the cake. Try with the lightly sparkling ripe strawberry flavours of the Moscato Rosa from Brown Brothers in Australia.